← It is a little miracle! Yesterday I did a little sewing, I did have to do it with two tissues stuffed up my nostrils, which does make drinking tea kind of hard, today I felt much better as did Jake, so he went to school and I went shopping and out for lunch. 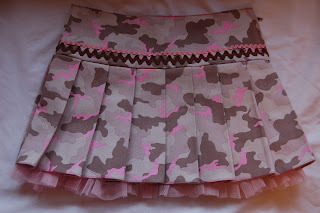 This is a skirt for the princess, which the boys reckon she will love, I hope she does. 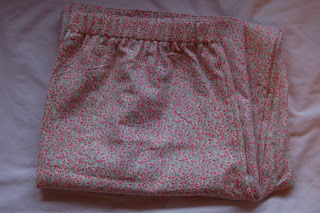 These jammies are for me as my very favourite ones, came apart recently and I was very sad, so these are nice cosy flannel and I am off to wear them now. Have a good weekend and I hope the sun shines, its peeing down right now!!! p.s I am kind of worried about what yarn my colour challenged husband will bring back, so will keep you posted…….sshhh! I’m really sharp this morning – here’s the link that I spoke about in my email – if you read my comments youwill see just how much I am challenged in the sewing department. But – I have cut out my pieces and am off to Remnant Kings as I can’t find my dressmaker’s carbon.